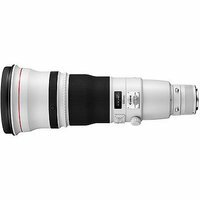 The Canon EF 600mm f/4L IS II USM is a high-magnification, super-telephoto lens featuring integrated Image Stabilizer technology and a fast f/4 maximum aperture. It features a lightweight magnesium alloy and titanium construction, which reduces weight without compromising on strength and build quality, while its optical design includes fluorite and UD lens elements to tackle aberrations and distortions. In addition, Canon's patented Subwavelength structure coating helps minimise ghosting and flare caused by internal reflections. Canon EF 600mm f4 L IS II USM Lens features built-in Image Stabilizer (IS) technology that enables hand-held shooting with shutter speeds up to four stops slower than normal. Part of Canon's flagship L-series professional lens range, Canon EF 600mm f4 L IS II USM Lens is perfect for wildlife, nature and sports photographers working in field.